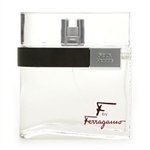 A captivating scent presented in an equally sophisticated package, F by Ferragamo pour Homme is the male expression of the signature Ferragamo style. The F by Ferragamo man exudes a sensuality that is understated. He is completely irresistible and utterly captivating. Have been looking for this for some time now and finally found it. Have received many compliments wearing it. Will definitely order more. It makes a statement. I had been searching for this and finally found it in your site. Very good price and it smells awesome. My boyfriend loves it.